Manila has a lot to offer when it comes to tourism and these include luxury accommodation. Popular five-star hotels in Manila abound and there is no shortage of hotels that offer quality service and high-level comfort at fair prices, too. Each luxury hotel competes for excellence which results in a winning situation for all guests who want to experience the best in what Manila hotels can offer. Listed are the top 5 luxury hotels and accommodation in Manila that are conveniently located in business districts and accessible to transportation. The Manila Hotel is not only a highly recommended luxury hotel for local and foreign guests, but is also a historical institution. The 570-room hotel is located nearby another historical landmark which is the Luneta Park. The oldest premiere hotel in the Philippines is situated along the Manila Bay and is a few hundred meters from the US Embassy. It is just a stone’s throw away from the Rizal Monument which is the resting place of the country’s national hero, Jose Rizal. Its penthouse was used as an office of General Douglas McArthur from 1935 to 1941 when he was still a military advisor. The New York Times holds office in this hotel. Famous personalities who have been guests in the hotel are Michael Jackson, The Beatles, actor John Wayne, US President John F. Kennedy, to name a few. The Hotel is the oldest premiere hotel in the Philippines. It is situated along the Manila Bay and is a few hundred meters from the US Embassy. It is just a stone’s throw away from the Rizal Monument which is the resting place of the country’s national hero, Jose Rizal. Its penthouse was used as an office by General Douglas McArthur from 1935 to 1941 when he was still a military advisor. The New York Times also holds office in this hotel. Famous personalities who have been guests in the hotel are Michael Jackson, The Beatles, actor John Wayne, US President John F. Kennedy, to name a few. Famous personalities who have been guests in the hotel were Michael Jackson, The Beatles, actor John Wayne, US President John F. Kennedy, to name a few. The Manila Hotel was built way back in 1909 but has maintained an elegant look through the years. Rooms are very organized and clean. The old Spanish era styled furnishings blend well with modern features. Dishes in its buffet tables vary from Filipino, Chinese and Japanese cuisines. Service is exceptional and crews are very accommodating and courteous. The Sofitel in Manila is also a five-star hotel situated along the Manila Bay. The rooms facing the Manila Bay provides a breathtaking view of the Manila Bay sunset. The wide lagoon-style pool area with cascading waterfalls also faces the Bay. All rooms are spacious and provide a contemporary feel. The hotel has 670-guest rooms and boasts of its Grand Plaza Ballroom which can accommodate up to 1400 people for large functions. The Ballroom features the exquisite Murano Crystal chandeliers. A good retreating facility is the hotel spa. It offers soothing massage and the latest in skin therapy. The landscaped gardens match the tranquility of the area even at the middle of the bustling city of Manila. The hotel also boasts of its lavish buffet experience highlighted by French gourmet delights and a spectacular wine cellar. A cheese room and a chocolate kitchen are a must visit areas in the hotel. Find out what guests reviews say of Sofitel Philippine Plaza. The Shangri-La Hotel in Makati is also considered one of 5 best luxury hotels in Manila. It is located at the center of the main business district of Makati. This luxury hotel stands 28 floors high beside the hundreds of skyscrapers and numerous shopping malls in the city. The international hotel has about 696 rooms and suites and it has a total of 3 ballrooms. The newest ballroom, the Isabela provides a modern events facility reinforced with audiovisual technology and interchangeable furniture. At the 24th floor is a club which is open to all its guests all night long. The hotel has 284 superior rooms and 224 deluxe rooms. The Shangri-La hotel in Makati is the recipient of multiple awards including The 500 World’s Best Hotels by Travel + Leisure from 2010 to 2013. It was also awarded the Best Hotel in Manila from 2010 to 2013 by DestinAsian Reader’s Choice Awards. Get the latest reviews of Shangri-la Hotel in Makati, Manila Philippines. Visit also Shangri-la at the Fort. EDSA Shangri-La Hotel is another 5-star hotel managed as well by the Shangri-La Hotels and Resorts. This group also manages the Shangri-La hotel in Makati. The hotel is located in another bustling area of Manila which is the Ortigas Center in Mandaluyong city. The beach resort-style hotel is considered a landmark building in Manila due to its unique architecture. The two white towers are set in a tropical garden between mostly residential areas. All hotel floors are made of marble. Its interiors are decorated with Asian paintings as styled with floral arrangements. The city resort hotel has 632 rooms and suites and four international restaurants as well as two lounges. An outdoor tennis court and a 24-hour gym spa are facilities guests should not miss. The Manila Peninsula has been the benchmark of luxury accommodation and sophistication for hotels in the country for as much as four decades. It is considered a haven for comfort, quality service as well as fine dining. It has been a favorite of many affluent locals including socialites and businessmen, as well as foreign dignitaries. The Peninsula Manila is a 5-star hotel located just in front of the Shangri-La hotel in Makati. It belongs to the Peninsula Hotels chain based in Hong Kong. The Hotel was built in time for the hosting of the International Monetary Fund Conference in Manila. 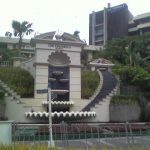 The main feature of the hotel is its exquisite fountain area located at the corner of Ayala and Makati Avenues, which were also the site of the country’s Millinneal celebration. The Peninsula Manila Hotel lobby is a sight to behold with the glorious “Sunburst” sculpture on the ceiling which was created by national artist Napoleon Abueva. There are other luxury hotels that have sprung in the last decade but these five are the most popular ones. So the next time you plan for a business or family trip, and you want only the best of the best, stay in one of Manila’s luxury hotels.